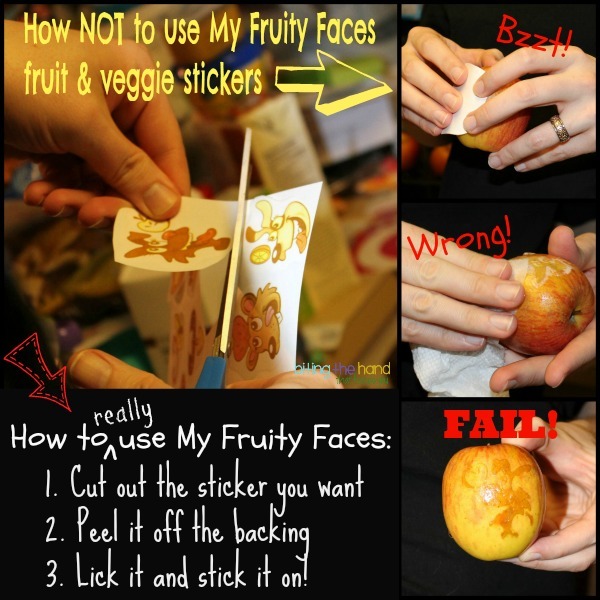 Biting The Hand That Feeds You: My Fruity Faces Edible Stickers - Play With Your Food! My Fruity Faces Edible Stickers - Play With Your Food! 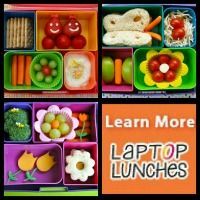 Studies show that kids given the exact same food in a plain package versus one with any cartoon character - even one they don't recognize - will not only prefer the one with the character, but say that the food tastes better and choose to eat more of it! We already know how powerful this is, with sugary cereals, fast food kids meals, and gummy "fruit" snacks - can you imagine the power we could wield if we apply this knowledge to fruits and vegetables? My Fruity Faces edible stickers does just that - with generic faces and monsters and pets, as well as with the popular kiddie icons Dora the Explorer and Spongebob Squarepants! For $19.99 (plus $6.95 shipping) you can get their 6 sticker pack assortment - with over 150 My Fruity Faces food tattoos, including 18 from Dora the Explorer and 18 with Spongebob characters! 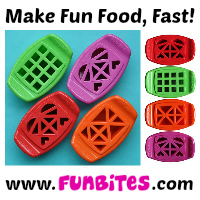 Imagine how fun these will be for back-to-school! 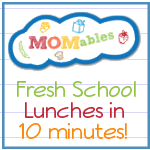 A new classroom, new teacher, new kids, but super fun lunches to remind them that you're there for them and brighten up their day! 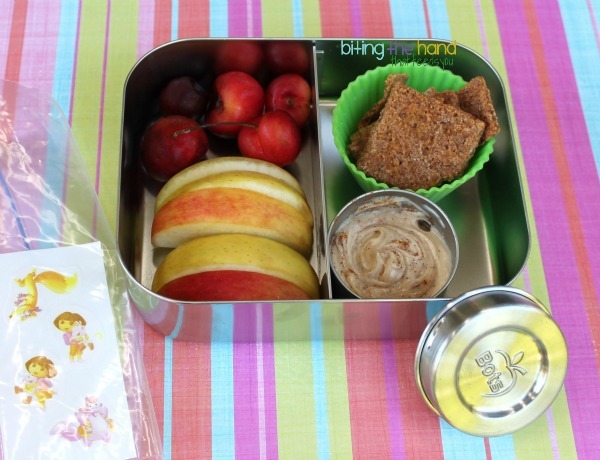 I send larger stickers, like Dora, for wider items like apple slices and to go on dips! 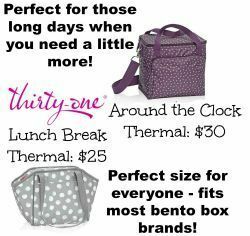 They motivate trying new things and encourage healthy eating choices! Gluten-free and free from most other allergens! Either there were no directions included or else I totally overlooked them, since Hubby and I couldn't figure out how to get them to work at first. We went with the traditional temporary tattoo method of wetting the paper and trying to apply that way. When that failed, we tried rubbing a wet paper towel gently on the tattoo. Fail. Even with our first failed attempt, Z was thrilled with having a picture on her apple, and I got some very excited grins as she ate it. I was stumped on how else to use these though, since if I put them on her fruits and veggies the night before or the morning-of, they'd be unrecognizable blotches of color by lunch time. And I was worried that she wouldn't be able to figure out how to get them to work. Once I decided to just go ahead and send them in a zip-seal baggie or small air-tight sauce container and give her a chance to try and apply, we were good to go! They were a hit! I included a few small eye stickers for small carrot sticks, to make a "carrot monster!" Including a few fruit stickers in her camp snacks this summer has not only been fun for her (and she gobbled down every morsel - including the veggies!) but also gave her and her peers something to socialize over. Z tends not to initiate social contact, so these were very helpful in allowing her and the other kids to get to know each other quickly. 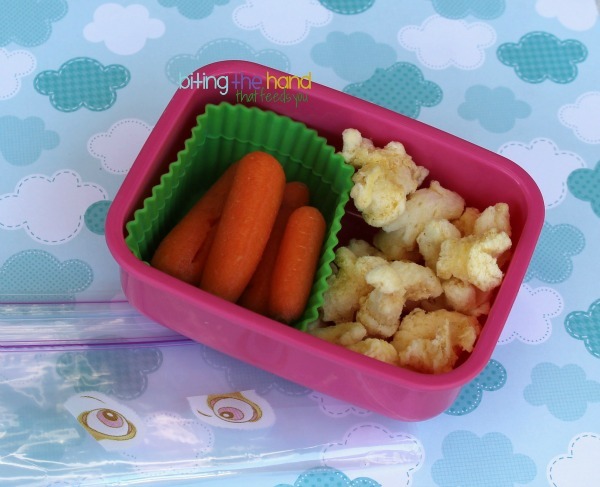 Plus the little baggie on top of the food in her boxes helps keep everything in place. I keep my opened packages in a zip-seal baggie, to keep them air-tight, to avoid moisture dissolving the stickers before we ever get to use them! Be sure to check out My Fruity Faces on Facebook, Instagram, and Twitter! We purchased these from a toy store called Karen's Toys in the Sherman Oaks Mall. I have two children and my sister has three. All under the age of 8. 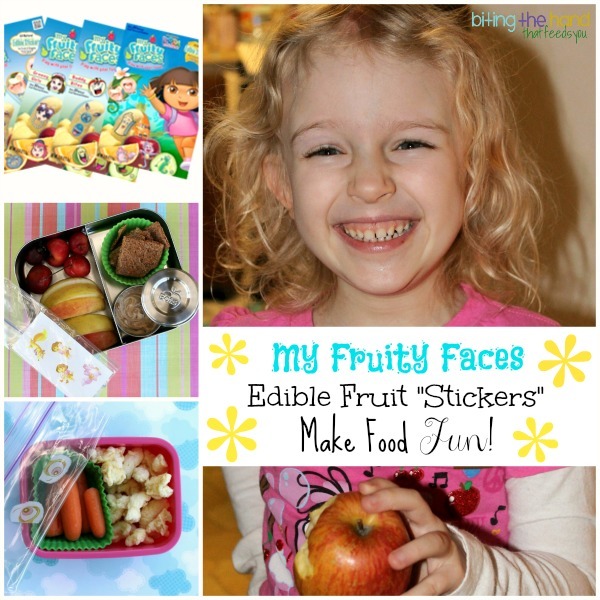 We put out a big tray of broccoli, cucumbers, zucchini and celery with the Dora themed My Fruity Faces edible stickers as well as the play full pets (So Cute) and all five kids devoured the entire tray. It was AMAZING!!! The kids just loved it.